Please watch and share. Thank you to Animalista Untamed for bringing this to our attention. A nice glimpse into the workings of the Humane Economy where everyone’s a winner, most of all the animals, we hope. Many thanks to Our World for sharing. It’s well worth the watch. One of the big news of the last couple of days is Sea World’s news release saying the end of orcas in Sea World is near. The promise is that no more breeding will take place at Sea World and that no new whales will be caught from the wild to be presented at any of Sea World’s parks. Additionally, orcas shows will be “phased out”, as CEO Joe Manby from Sea World promised. The pressure on Sea World has increased dramatically since the release of the movie “Blackfish” to stop all orca programs and to release all captive orcas back into the wild. Joe Manby states that setting the orcas free who have lived all or most of their lives in captivity would most certainly lead to their deaths since they would not know how to survive in the wild. It is to be hoped that Sea World will stick to all their promises and commit themselves to rescue missions instead of animal captivity. In the last weeks we have heard news about some circuses thinking about retiring their elephants – but not before 2018. That means three more long years imprisoned and tortured for “entertainment”. Most zoos should at least follow suit since most of them are not capable of caring adequately for the lives of those imprisoned in their care. And some elephants need immediate help due to their health status. Three more years in their current situation is a death sentence. Asha is one of these animals. “Local news outlets are reporting that Natural Bridge Zoo will remain closed for the foreseeable future. The facility was scheduled to reopen the weekend of April 4 after being closed for the winter, but on April 3, 2015, a judge refused to restore the facility’s state permit, which was suspended following numerous violations of the federal Animal Welfare Act. When the Virginia Department of Game and Inland Fisheries suspended the facility’s state permit on March 9, 2015, it stated that “many of the animals are confined under unsanitary and inhumane conditions.” We will continue to keep you informed of any developments. 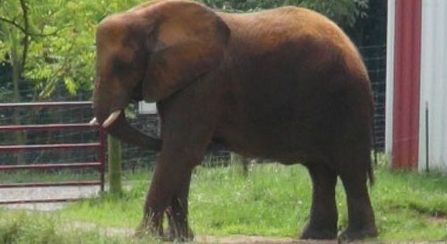 If you haven’t already taken action, please sign our petition urging the zoo to retire Asha the elephant. “The USDA has ordered Nosey out of the circus where she was performing in Texas and back to Florida for a veterinary check! 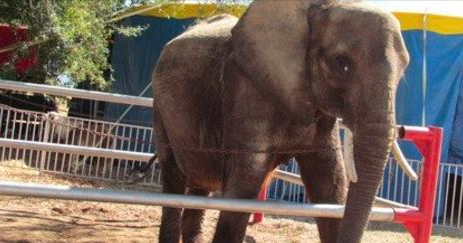 Thank you for helping and we will keep you updated on Nosey´s progress. Do keep in mind to let your city officials know that you do not want circuses with animals performing in your city. From Bliss Back to Abuse? First, there is the good news of an animal being saved after over 50 years of abuse and torture. Not everyone agrees with anthropomorphous ways of thinking, but it is most certain that an animal freed will delight in this newly found freedom. But going back to the ordeal is probably the worst kind of abuse. 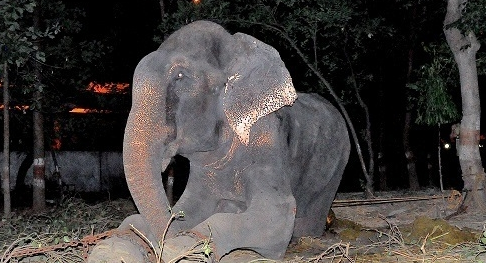 “We rescued Raju after he spent approximately 50 years chained up, beaten, and help captive by beggars in India. His rescue story went viral online because this abused elephant was crying tears of joy when he was finally set free in a loving environment at our elephant sanctuary. At the time of his rescue he was near death. He was emaciated, dehydrated and exhausted. Despite his frailness, he was forced to beg on the streets and was being kept in spiked chains. 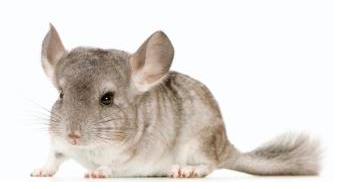 There are many chinchillas being kept as pets. Subjectively, I believe most of them are in homes unsuited for these rodents whose looks make them more “likable” than for example rats. Since chinchillas can live for up to twenty years chances are they will not be kept by the same people their whole lives. These little animals come from the Andes mountain range, do not like heat nor high humidity. But more often than not, they have to live in surroundings totally unsuitable for them. And then there is their beautiful fur. 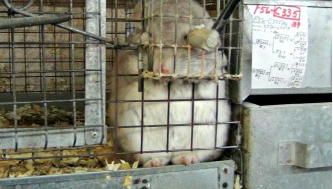 Some people would rather wear their chinchilla as coat than take care of the live animal. With the help of the Marine Mammal Center in San Francisco this young sea lion was nursed back to a life of typical sea lion pleasures. It is good to know there are people who do not look away but jump to the rescue. Thank you!